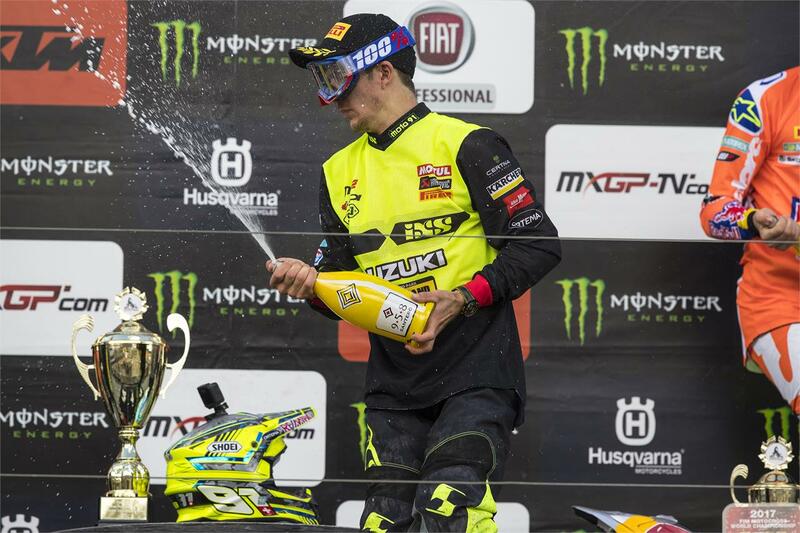 Jeremy Seewer battled hard in both motos as he took his fifth MX2 GP at the MXGP of Sweden. On a day where the weather conditions were constantly changing, the Uddevalla track provided a real test for all the riders, but Seewer coped the best and topped the scores with 44pts. Behind him, Hunter Lawrence also showed everyone how to ride the track, running in second place in the second moto, just behind Seewer as the Suzuki RM-Z250s were in first and second position. In the end, the Australian came home in sixth place, but it was further confirmation of just how talented the young Australian is. Zach Pichon also proved he can run with the MX2 guys, putting in two solid motos, showing good speed and battling hard on what was his MX2 debut. With three rounds left, Seewer still has his sights set on over-turning the deficit at the top of the MX2 Championship and hopes to get another win for the Suzuki World team when the series resumes in the USA on September 2nd. MX2 Moto 1: 1. Jorge Prado Garcia (ESP, KTM), 34:43.460; 2. Jeremy Seewer (SUI, Suzuki World MX2), +0:01.823; 3. Pauls Jonass (LAT, KTM), +0:28.793; 4. Conrad Mewse (GBR, Husqvarna), +0:30.835; 5. Brian Bogers (NED, KTM), +0:38.535; 6. Darian Sanayei (USA, Kawasaki), +0:39.396; 7. Benoit Paturel (FRA, Yamaha), +0:40.303; 8. Ben Watson (GBR, KTM), +0:42.035; 9. Thomas Kjer Olsen (DEN, Husqvarna), +0:43.397; 10. Calvin Vlaanderen (NED, KTM), +0:46.421; 11. Michele Cervellin (ITA, Honda), +0:47.334; 12. Hunter Lawrence (AUS, Suzuki World MX2), +0:48.500; 30. Zachary Pichon (FRA, Suzuki World MX2), -1 lap(s). MX2 Moto 2: 1. Thomas Covington (USA, Husqvarna), 34:06.609; 2. Jeremy Seewer (SUI, Suzuki World MX2), +0:00.055; 3. Pauls Jonass (LAT, KTM), +0:21.635; 4. Thomas Kjer Olsen (DEN, Husqvarna), +0:22.772; 5. Jorge Prado Garcia (ESP, KTM), +0:24.457; 6. Hunter Lawrence (AUS, Suzuki World MX2), +0:24.811; 7. Benoit Paturel (FRA, Yamaha), +0:25.192; 8. Conrad Mewse (GBR, Husqvarna), +0:35.912; 9. Darian Sanayei (USA, Kawasaki), +0:38.203; 10. Calvin Vlaanderen (NED, KTM), +0:44.945; 31. Zachary Pichon (FRA, Suzuki World MX2), -1 lap(s). MX2 Overall: 1. Jeremy Seewer (SUI, Suzuki World MX2), 44 points; 2. Jorge Prado Garcia (ESP, KTM), 41 p.; 3. Pauls Jonass (LAT, KTM), 40 p.; 4. Conrad Mewse (GBR, HUS), 31 p.; 5. Thomas Covington (USA, HUS), 30 p.; 6. Thomas Kjer Olsen (DEN, HUS), 30 p.; 7. Benoit Paturel (FRA, YAM), 28 p.; 8. Darian Sanayei (USA, KAW), 27 p.; 9. Hunter Lawrence (AUS, Suzuki World MX2), 24 p.; 10. Brian Bogers (NED, KTM), 23 p.; 32. Zachary Pichon (FRA, Suzuki World MX2), 0 p.
MX2 Points Standings: 1. Pauls Jonass (LAT, KTM), 669 points; 2. Jeremy Seewer (SUI, Suzuki World MX2), 624 p.; 3. Benoit Paturel (FRA, YAM), 504 p.; 4. Thomas Kjer Olsen (DEN, HUS), 497 p.; 5. Julien Lieber (BEL, KTM), 436 p.; 6. Thomas Covington (USA, HUS), 417 p.; 7. Jorge Prado Garcia (ESP, KTM), 392 p.; 8. Brian Bogers (NED, KTM), 331 p.; 9. Hunter Lawrence (AUS, Suzuki World MX2), 284 p.; 10. Brent Van doninck (BEL, YAM), 273 p.